Finn, a young boy, is lonely. Puss, a cat, is lost. Then Finn and Puss meet. Suddenly Finn isn’t lonely anymore, and Puss seems quite happy to be with Finn too. So when Finn sees a ‘Lost’ poster, put up by Puss’s owners, he’s faced with a tough decision. Will he do the right thing? Author, Robert Vescio, shares his inspiration for this moving tale and his thoughts behind its meaningful morals. What does that little voice inside my head say about it? Finn and Puss is a story that matters. Children need to know that finders are not keepers. Things, including pets, belong to someone. Doing the right thing shows that you are honest, responsible and truthful. It all boils down to ethics and integrity. And just like Finn, sometimes you get a reward or make a friend for doing the right thing. But other times, it’s just the satisfaction of knowing in your heart that you did the right thing. 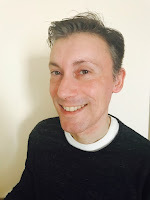 A similar situation faced by my children sparked the inspiration for this story. I was very proud of their decision. So I quickly put pen to paper and wrote this story to help other children who are faced with the choice between right and wrong. Melissa’s stunning illustrations complement the story beautifully. They are positively breathtaking, highlighting the setting and mood of the story perfectly. 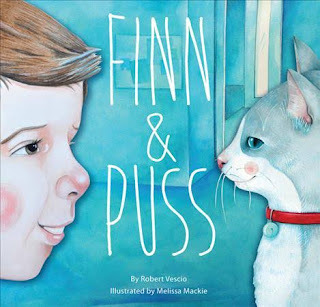 The high quality of her images make Finn and Puss a great book for both young and old to enjoy. 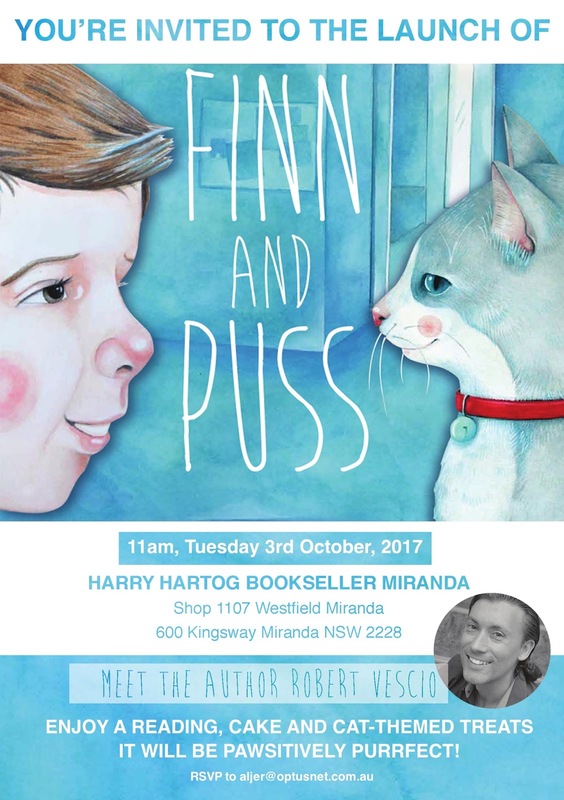 If you are the type of person who chooses a book by its cover, Finn and Puss should certainly be a popular choice. Waiting to finally see Melissa’s illustrations in colour and to be able to share and show the world our beautiful book. Keep an eye out for our upcoming review on this gorgeous picture book. Those living in NSW can meet Robert in person when he launches, Finn and Puss next Tuesday 3 October.